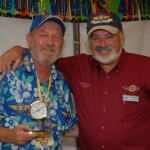 For many years at AirVenture, one individual would be selected each year as Volunteer of the Year – the person who most exemplified the cheerful dedication which is the heart of Vintage. 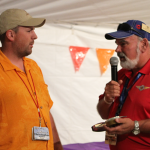 Presenting this award, like awarding Lindys to our aircraft owners, is one of the culminating ceremonies of the Vintage year since our calendar does not operate from January 1 to January 1, but instead from Oshkosh to Oshkosh. Volunteering is the backbone of Vintage. Because of our long-standing tradition of pitching in together, we have this amazing cadre of dedicated volunteers who work year-round and journey to Oshkosh each year to reunite with their extended family. Because of this we have become a world-wide association with only one full-time paid staff member. Quite a feat. For many years this effort by our Board of Directors and AirVenture Chairmen was lead by Art Morgan, a long-time volunteer himself who served for many years as Flight Line Chairman and Vice President of Vintage. 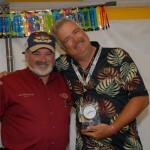 Upon Art’s untimely death in 1996, Art’s field call sign, “Antique One,” was retired and the decision was made to expand our award into two categories – Flight Line Volunteer of the Year and Behind the Scenes Volunteer of the Year – and rename the award The Art Morgan Volunteer of the Year Award.